STORA ENSO OYJ PRESS RELEASE 4 June 2018, 15:00 EEST Stora Enso has today opened Europe’s largest wood fibre-based biocomposite plant. 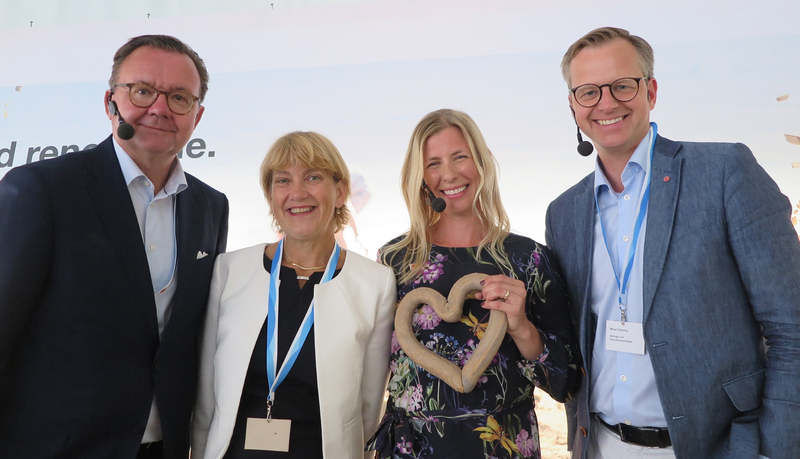 The opening ceremony took place at the company’s Hylte Mill outside of Halmstad in south-west Sweden, and was attended by more than 150 guests. Stora Enso’s investment of EUR 12 million in a biocomposite plant is part of the company’s ongoing process of becoming a renewable materials company. It shows that Stora Enso is a leader in the bioeconomy, with the ability to provide innovative, more sustainable alternatives to plastic. The company’s biocomposites, DuraSense™ by Stora Enso, make it possible to reduce the consumption of plastic by up to 60% and replace it with renewable wood fibre. Uses for biocomposites include everything from consumer goods to industrial applications, such as furniture, hand tools, automotive parts, toys and kitchen utensils. The combination of natural wood fibre, polymers and additives offer the mouldability of plastic with the sustainability and workability of wood. “Biocomposites are another step towards replacing fossil-based materials. There is great potential for these renewable materials, so we are delighted to be opening Europe’s largest wood fibre-based biocomposite plant today,” says Karl-Henrik Sundström, CEO of Stora Enso. Link to further information on Stora Enso biocomposites: DuraSense™ by Stora Enso.